We are pleased to announce the release of this new book of the IRG. The political, social and financial crises currently shaking the world are generating ever greater mistrust between societies and states. The popular “revolutions” of recent years are unambiguous. It is the state’s managerial approach and its protection of specific interests that provoke anger among the people and rejection, not the state as such. But faced with its failures, populations self-organise or turn to other “authorities” and role models, who compete with or even replace the state in a rampant, authoritarian or violent way. This raises the question of the state’s legitimacy, that is, the basis for the voluntary adherence of populations to the state, conferring on it its status as supreme political authority. Legitimacy is at the heart of the definition of the meaning and shared values that are supposed to organise the living together, social integration and the effectiveness of the state. In this respect, the question of legitimacy raises serious and important issues. It is not pure fantasy of intellectuals in need of inoperative concepts. It is a pillar of the peaceful regulation of societies and a condition for the survival of democracy. 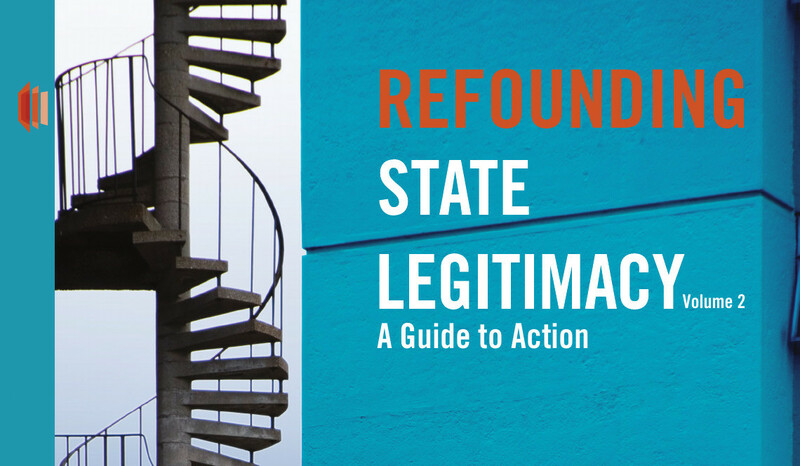 This book offers a practical methodology of legitimacy for a democratic refoundation. While the first volume was intended to describe the processes of legitimisation of political power in different countries, this second volume lays the foundation for a political approach, the implementation of “plural public action”. Bridging theories and practices, it intends to give state and non-state actors the capacities, the means and especially the desire to act in order to make social pluralism live and contribute to its institutionalisation: the refounded state. (IRG). The book can be purchased on Lulu.